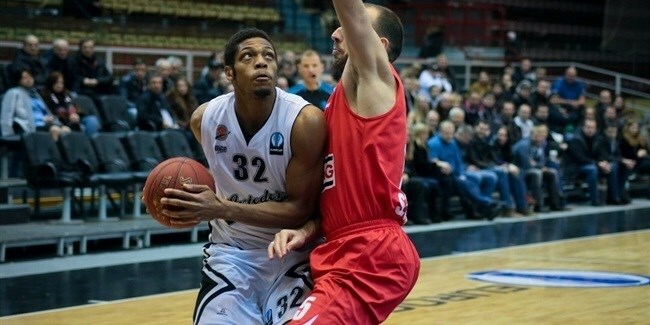 Avtodor Saratov kept getting ready for its Eurocup debut next season by inking versatile forward Jeff Brooks to a two-year deal on Friday. Brooks (2.03 meters, 26 years old) arrives from Dinamo Banco di Sardegna Sassari, where he averaged 9.3 points, 5 rebounds and 2 steals in 8 Turkish Airlines Euroleague games last season. He helped Sassari win as many as three domestic titles - the Italian Supercup, the Italian Cup and the Italian League. Brooks started his professional career with Fileni BPA Jesi and made his Euroleague debut with FoxTown Cantu in the 2012-13 season, averaging 8.3 points and 4.9 rebounds in 10 games. He has also played for Pasta Reggia JuveCaserta also of Italy. Brooks is set to make his Eurocup debut with Avtodor next season. Prior to its final Eurocup game of the season, Avtodor Saratov has changed head coaches for the second time this season.